The Mini 3x3 cube measures just 3.0cm across, making it almost twice as small as most conventional 3x3 cubes. Scramble the colored squares on this addictive and multi-dimensional cube. Then twist, turn, and rotate to match up the colors. Show your kids some math principals by demonstrating how it can be used to more efficiently solve these question. Lots of grooves on the surfaces of edges and other parts of the cube highly reduce impact surfaces to make the cube turn faster. They are always awesome for both kids and adults. You Don't Need To Worry About The Quality Of Toys, Please Contact us by email, We Offer 1-year free replacement GUARANTEE If You Have Any Dissatisfaction. So Leave Out Your Doubt, Enjoy Our Services. 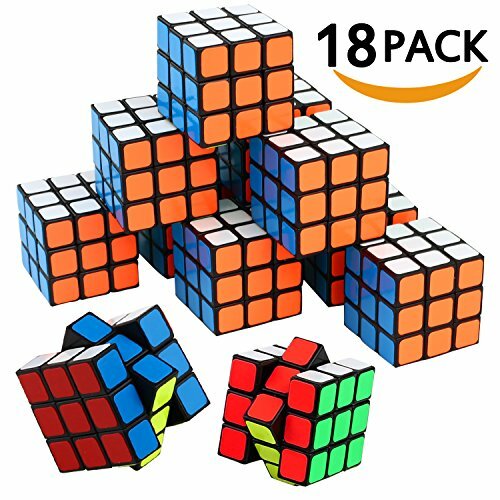 Puzzle toy, includes 18 mini magic cube, is crafted with Eco-friendly ABS plastic material, which has non-toxic, odorless features. Brain Teasers, can improve your child's memory, ability to solve problems and practicing hands-on dexterity skills. Stickerless gift, each one measure approx 1.18 inch, is a good choice to ease your boring mood and reducing stress. If you have any questions about this product by KarberDirect, contact us by completing and submitting the form below. If you are looking for a specif part number, please include it with your message.